IQinVision, market leader in high-performance HD megapixel IP cameras, recently announced the release of the next generation of its world-renowned IQeye Alliance-mx HD megapixel series of cameras. One of the company’s most successful cameras for both indoor and outdoor use, the Alliance-mx not only includes the increased processing power needed to run analytics or VMS applications at the edge, it also features WDR, built-in IR illumination, on-camera storage, two-way audio and true day/night capability. Available in H.264 Main Profile vandal dome models with support for HD720p, HD1080p, and 3MP resolutions (5MP coming in March). The Alliance-mx delivers the highest quality megapixel images with the lowest bandwidth demands. 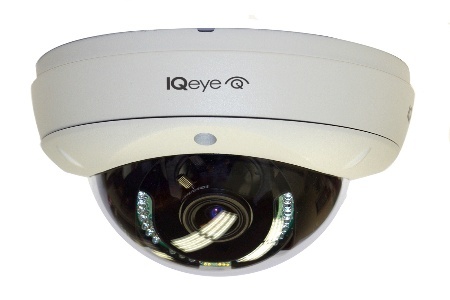 Both ONVIF and PSIA compliant, this updated IQeye Alliance-mx has been designed for a wide range of applications and works seamlessly with all leading NVR/VMS providers. The Alliance-mx camera line has a full complement of available accessories to ensure ease of installation for any application including wall, corner, pendant and flush mount kits, smoked domes and more. As with all Alliance dome and 3 Series cameras, these new models are backed by the industry’s best and only 5-year, all-inclusive warranty. “This new line of Alliance-mx cameras comes on the heels of our recent release of the next generation IQeye Alliance-mini, which has met with unprecedented demand. We expect this newest, full-featured camera line, built with our industry-leading reliability and the warranty to back that claim up, will be just as popular as the new Alliance-mini,” Rob Ledenko, Executive Vice President of IQinVision. The Alliance-mx’s versatility and edge capabilities combined with stunning HD image quality have already proven to be a winning choice with installers and end users alike. The newest Alliance-mx HD megapixel cameras will begin shipping February 17th.